How can you help sell your park home and reduce maintenance as well? One key way is to make sure that the outside space is well maintained. Outside space is also very important to a potential purchaser, with gardens being described by some estate agents as the ‘Outside room’ in their sales particulars. The only downside to having a fabulous garden is that it can require a lot of maintenance. So how do you minimise garden maintenance? One option that can certainly add value and reduce the maintenance of your park home is the addition of decking in your garden which looks great when raised. 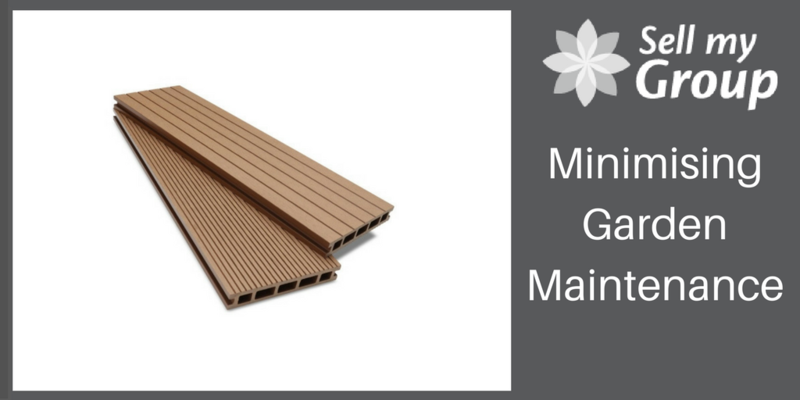 However, if you are looking at decking without maintenance make sure you look at all the decking options; plastic or uPVC, aluminium or composite. Another option is to accesorise your current decking on your park home, from adding LED lighting to access gates. Sell My Group have exhibited alongside UK Sundecks at a number of shows and is one of the leading decking companies in the UK. Paving can also work well (as long as it is grouted) and you can place tubs on top of them. The other two options to mention are gravel, which can have a problem with weeds, unless a woven polypropylene landscaping material is put down first and lawns. To be precise, we mean artificial lawns. Fresh artificial grass offers an option for a low maintenance garden that looks well (like real grass) and is exceptional value for money in the long term, but does have a bigger initial outlay. If you cannot decide what to go for, a combination of different finishes looks good, but importantly, garden maintenance is essential! For further reading on park home maintenance, take a look at our Sell My Group Blog.